Introducing Bo the Bunny! A PDF Pattern! 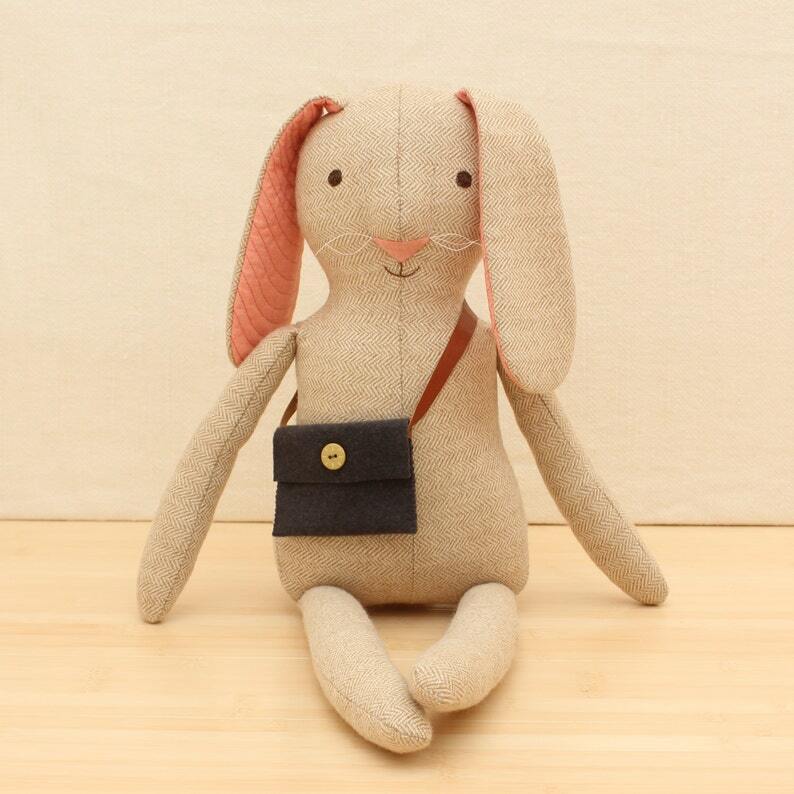 Bo is a sweet, gentle rabbit with a dimensional nose and quilted ears. Simple embroidered and appliquéd features give Bo his gentle look. His tail is positioned just right so Bo can sit all by himself. Use wool suiting, felt, flannel, corduroy, cotton, linen, or any soft fabric to construct the body and choose a contrasting cotton for the inner ears and nose. Bo has whimsically placed ears, with one parallel and one perpendicular, so you know he is a a great listener. Bo’s quick to sew messenger bag is perfect for love notes. With or without the messenger bag, Bo is the perfect companion. Bo the Bunny is 23" from his toes to the top of his head. This pattern includes complete instructions, photo figures, and full size templates. This pattern is suitable for very confident beginners. provide more children with their very own dolls. Thank you so much. This pattern was designed by Deborah Fisher especially for Bo Twal. Please email us at contact[at]botwal.org. PDF Pattern for Sewing Smiles Doll. The profits from this pattern will be used to provide one doll to a child in an underdeveloped country. Beautiful pattern from a shop with a most noble cause. Instructions easy to read and follow. Thank you for all you do. Very charming pattern. Clear, detailed, thoughtful instructions. Thank you. I will be making these dolls - the pattern and directions are easy to understand. Doll Pattern for Sewing Smiles Doll. The profits from this pattern will be used to provide one doll to a child in an underdeveloped country. Bo Twal is a non profit, 501c3, organization run by five volunteers. All profits from your purchase will be used to provide handmade dolls to children in an underdeveloped country, and income to the sewists in that country. Due to the non profit nature of Bo Twal, we can not provide refunds. We do, however, want you to be as happy as can be! Please contact us with any issues or questions and we would be glad to work with you. Please make many doll and animals from Bo Twal patterns and give them away to family, friends and those in need. In keeping with our mission, we ask that you do not SELL any dolls or animals you make with Bo Twal patterns. Bo Twal patterns are for personal use only. Please do not reproduce without our permission. If you need another pattern, please purchase it so that we can provide more children with their very own dolls. Thank you! If you post images of your creations made with Bo Twal patterns, please credit Bo Twal as the pattern designer. Please post your photos on our Flickr page and #botwal, #sewingsmiles, #bothebunny on social media.